Learn how to overcome your fear by getting information and tips. This Course starts with some facts, goes to unlearning your fear and ends with an intervieuw by Felicia Slattery about her proeven speaking techniques. Even if you’re an experient speaker you can feel this fear over and over again. Learn how to remove it and how to improve your speaking. By knowing what you’re doing, you get confidence and will lose the unwelcome felling you don’t want to have. Starting as speaker is for sure not easy. First part from Felicia’s Notes: The way to overcome speaking anxiety is to be prepared. The thought of speaking should scare the snot out of you if you don’t have a plan. It is scary to be standing there and having all these people looking at you. It is a terrifying thing. ….. Read more and see the full video in the end of this course. 3 of her tips: Practice, Know what to expect when you get nervous. Visualize yourself giving the speech. See the fragment to learn more and follow the course to learn all. Felicia J. Slattery, M.A., M.Ad.Ed., is on a mission. As a cancer survivor, Felicia’s enthusiastic passion for communication is contagious. She knows that one important message delivered with power can transform a life. 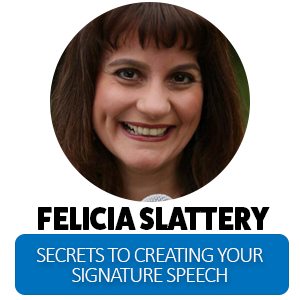 During this session, she shows you how to easily craft and practice your signature speech. That enables you to build your author’s platform and sell books like crazy.